To decorate the High Street and help to create a festive atmosphere we would love if you were to make a flag – or several flags! The theme for this years flags is “Birds, Beasts and Bugs”. The flags will be suspended from horizontal poles attached to the lamp posts. 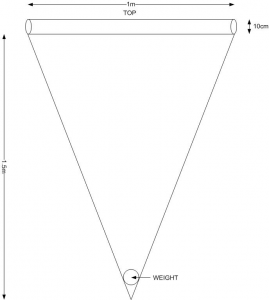 The flags should be triangular or rectangular (1 metre in width and 1.5 metres in length; please refer to the attached diagrams). There needs to be a slot across the top through which to slide a pole. Each lamppost will have 2 flags. Flags must be made of material (an old double duvet cover is a good starting point) and decorated with cut out material or fabric paint designs. The use of these media will help the flags to be as weatherproof as possible. The designs should be on both sides of the flag. Please make the flags as rain and wind proof as possible. All flags must be sewn firmly together. No use of staples or Velcro please. The windy conditions have made such flags impossible to display. We will make a small hole in the bottom corners of each flag to attach cord. This enables us to tie the bottom of the flags to the lampposts and ensures that they do not wrap around themselves. 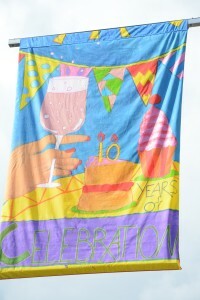 Flags will need to be completed by Monday 4th June. If you would like more information please contact us.